Man, I never realized how savage the stereo separation on this synth-driven 80's pop song is. It's almost disorienting behind Corey's pre-Michael Bolton-esque first verse. Then the dance beat cuts in on the pre-chorus to ease us into ripping off the 80's hair-metal trend and we're cruising to maximum single sales. 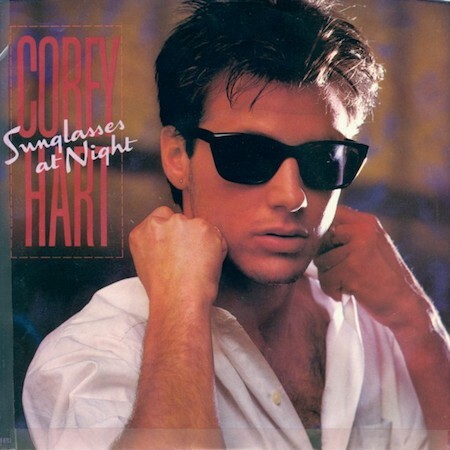 Corey really puts on the overdrive to match the hot guitar licks and squeezes the most out of his stardom until the track fades out into the darkness of that night he's wearing his sunglasses in. Wait a second, what the hell is this song even about? Apparently Mr. Hart wrote the lyrics, but they don't seem to make a ton of sense. I mean, there's a cool switchblade reference and I'm sure he's trying to get some of that Michael Jackson "Beat It" vibe going on, but it's basically nonsense. Or too deep for me. The B-side sees Corey listen to the Police records about 100 times and then say "let's do that!" There's a little bit more Peter Gabriel weirdness and a hint at some second wave ska in the chorus that adds some distance from the Police. There's a pretty sweet pause before the last chorus, but otherwise this comes across as a bit whiny and not nearly as original and interesting as a Police record. The fade out is weird and maybe the engineer fell asleep at the faders for a second because there's a strange volume jump in the bass just before the gentle fade as Mr. Hart croaks out one last "At the dance, oh oh." Maybe he should have kept his sunglasses on for this one?